Alberto Contador completed the second half of his challenging gran fondo yesterday by climbing the legendary Mortirolo. The weekend event, which included a climb of the Gavia on Saturday, drew hundreds of participants. Among them were big names like Ivan Basso and Alessandro Ballan, as well as riders from the Contador Foundation's U23 team and ambitious amateurs. Thanks to @2WheelTonio for posting the video. A great weekend of cycling began today in La Vatellina as stars Alberto Contador and Ivan Basso led hundreds of amateur riders up the Passo di Gavia, starting from Ponte di Legno. The second and final part of the two-day event will take place tomorrow, Sunday, with the climb of the Mortirolo. Riders from the Alberto Contador Foundation have come from Madrid to experience their first point of contact with this legendary mountain, as they did with the Gavia today, ushered by Contador and Basso. Contador and Basso confirmed yesterday in a press conference that they will work together next season in the ranks of Trek-Segafredo, where Alberto’s top priority will be fighting for another Tour de France win, after having made, as he says, “the best decision possible from a sporting perspective,” for what will be his new team as of January 1. Ivan Basso will accompany Contador to Trek-Segafredo as a technical consultant, responsible for relations between riders and staff, and working especially with young riders from the Foundation whom he will follow closely throughout the season. This is the fifth season that Contador has visited La Valtellina to offer his young riders the chance to get to know some of the most important climbs in the history of cycling. Team manager Fran Contador has chosen Juan Pedro López, Alejandro Ropero and Carlos García to participate this year in what will surely be a formative experience in their careers. MARCA | Although he’s legally bound to wear the Tinkoff crest on his chest – his contract runs until December 31 – Alberto Contador is already thinking like a member and leader of Trek-Segafredo, his new squad for next season: “It’s an exciting setup. I’ve chosen it for sporting reasons, above all, thinking about the Tour de France. Alberto Contador confirmed the scuttlebutt of many weeks today by announcing that he has signed a contract to ride with the Trek-Segafredo team in 2017. Alberto's announcement at Twitter was quickly confirmed by a press release from the team. 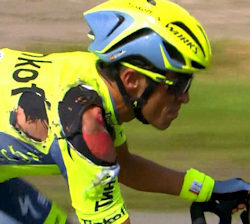 Contador takes with him his gregario and right-hand man, Jesús Hernández. Also joining him at Trek-Segafredo will be Steven de Jongh, the directeur sportif who played a crucial role in many of the triple champion’s victories at the Tinkoff team. Trek-Segafredo, already a strong outfit, has significantly strengthened its hand with signings for 2017. New recruits like John Degenkolb, and key helpers who have re-upped, like Haimar Zubeldia and Jarlinson Pantano, will provide a fresh atmosphere of team spirit and ambition for Alberto as he remounts the Trek bikes that have already carried him to victory in all three grand tours. Contador and all of his current teammates are facing a change of workplace next year, since the owner of the Tinkoff team, Russian billionaire Oleg Tinkov, has grown tired of the project and will shelve it on December 31. MARCA | by Nacho Labarga | 8-5-2016 | Alberto Contador’s premature farewell to the Tour has made him turn the page of his metaphorical road book in the last leg of the course. Unable to attend the great showdown in Rio – which figured as one of his top bids of the season – Alberto Contador is competing this week in Burgos with the intention of recapturing the red jersey of the Vuelta a España once again. You’re getting back into rhythm in Burgos looking ahead to the Vuelta: Will you arrive at 100%? After abandoning the Tour, we banked on doing the Clásica San Sebastián and the Vuelta a Burgos in order to log kilometers ahead of the Vuelta, which is now the main objective of the season. While you climb Las Lagunas, Spain will be making a play for the medals in Rio… Do they have a chance? I’m optimistic ahead of this occasion. I think that we have a very powerful team with Valverde and Purito at the head. As for me, it’s a shame that I can’t compete there, but now it’s my turn to be in Burgos to keep polishing my preparation ahead of the Vuelta. Clearly I would’ve liked to have been in Brazil. It was one of my main goals of the season, but circumstances have prevented me from being there. From here I want to send all my support to my compañeros so that they come home with a medal. They can do it, without a doubt. For the Vuelta, are you afraid of the level of your rivals, or that yours won’t be tops? As for my physical level, I’m recovering little by little. I think that, making a good plan, I’ll be able to arrive at the Vuelta in my best form. Anyway, what’s clear is how dangerous these rivals are. They’ll put me in more difficulty than my own body will. The Vuelta is the grand tour that is most repeated in your palmarés. Is it the easiest tour to recapture? I don’t know. For me the Vuelta a España is not the simplest of the three. We’re already seeing the list of participants that there’ll be this year, with riders like Froome, Nairo, Valverde, Landa… The route holds suprises for everybody. Every year it seems that it outdoes itself. The roster is tremendous, so it will be really complicated to walk off with the race. Have such bad crashes and shock aftected your morale? It’s true that it takes a toll on your head. It’s not simple to be preparing over the course of many months for a contest only to be taken out by crashes. It’s hard to get back up. It’s not just the physical road rash and discomfort, but rather it’s all the baggage that goes with it. Luckily we’ve put that all to the side. I’m confident that we’ll be luckier from now on. Do you think that your best version is still viable? At least as far as aspiration and work goes, yes it is. Results are another thing. Recently they haven’t been what we wanted, but I’m convinced that they’ll reappear if I keep working in this line and we don’t have bad luck. I still have great races left to do, I’m really motivated. If I continue longer in cycling it’s because I really think that I can keep winning in the best races. When will you announce your signing with Trek? What’s Trek? (laughs) I still don’t know anything about this signing, so I can’t announce when the incorporation will be. The only thing I know is that I’m a Tinkoff cyclist until December 31. Until that date, I’ll defend the colors of this team and I can’t say much more about this subject. We’ll have to wait to know more details about my future. Now I’m only thinking about the Vuelta a Burgos, about riding, and about recovering in order to feel my best physically. Although it’s not official, what do you think of the setup? I can say that Trek is a great team. It’s an established organization in the WorldTour, one of the most powerful in the world. It’s a very strong squad and anybody would like to ride there. Will you take your usual domestiques to the new team? Nothing has been confirmed yet, so I can’t talk about those subjects either. However, for my part, I do in fact always like to take my right-hand men with me. Any leader wants to have with him the cyclists who support him in key moments. Is Sky or is Froome really unbeatable? For me, right now, it’s more Sky than Froome. Obviously Froome is a very strong rider both in climbing and the time trial, but a rider can have a bad day. When you have a team in which anyone is capable of being a leader, that multiplies the difficulty a bit. And finally, what would you like to win before you hang up the bike? I have perfect clarity about that: next year’s Tour de France. It’s my main objective. I think that I have the conditions to manage it. Although, before I get there, there are other challenges left to achieve. I won’t be in Rio, but I will be at the Vuelta a España. DIARIO VASCO | Alberto Contador will not participate in the Olympic Games in Rio de Janeiro. The cyclist, who withdrew on Sunday from the Tour de France, suffered “multiple contusions, a second-grade fibrillary laceration to the anterior thigh muscle of the left leg, a fibrillary laceration to the left calf muscle, and contusions to the supraspinatus of the left shoulder and to the deltoids of the right thigh. The fact that his left quadriceps and calf were greatly compromised had a big effect on his pedaling. It caused pain and overburdening of the quadriceps,” revealed Dr. Manuel Leyes of Madrid’s CEMTRO Clinic. He also said that three MRI scans had been taken in order to evaluate the extent of the injuries. After Dr. Leyes spoke, Contador, now facing time off the bike, confirmed that he will miss the Olympics. “The Olympics are virtually ruled out and it’s a shame, because I think that, judging by the profile, I could’ve done well. It was the second big objective of the season. It’s a tough moment, but I prefer to look to the positive in all this,” the Spanish cyclist said. Finally, about his possible signing with a new team, Alberto Contador said that he will make a decision with his agent. “I’m a Tinkoff rider until the end of the year,” but “very soon, we’re going to close on an agreement with a team and next year we’ll try again." Alberto Contador announced in a midday press conference at the CEMTRO Clinic today that he is facing a four-week period of recovery from the injuries that he sustained in the first two days of the Tour de France, reported as.com today. He will almost certainly compete in the Vuelta a España. The Spanish grand tour will be his final objective this season and occupy his total focus in the coming weeks. 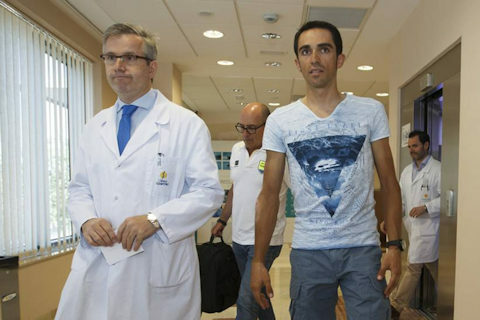 Alberto Contador will undergo a medical evaluation tomorrow, Tuesday, July 12, at the CEMTRO Clinic in Madrid, where he will be examined by Dr. Manuel Leyes. Dr. Leyes will investigate the condition of the Tinkoff rider, who abandoned the Tour de France after being unable to recover from crashes on two consecutive days. After the examination, done to rule out the presence of any possible injury or aftermath from the traumas sustained in the race, Contador and Dr. Leyes will give a press conference at 13:00 in the Salon de Actos of the CEMTRO Clinic, a facility that specializes in treatment and rehabilitation for professional athletes. Note: Alberto was treated by Dr. Leyes at the CEMTRO Clinic in 2014 after he crashed out of the Tour with a fracture in his leg. He was able to recover in time to ride the Vuelta a España, and won the overall title - his third - two months to the day after leaving the Tour.